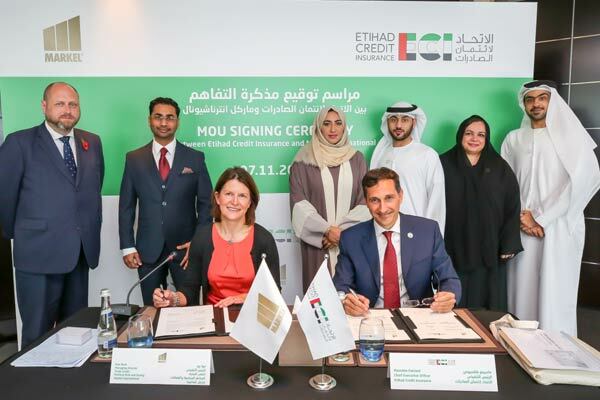 Etihad Credit Insurance (ECI), the UAE Federal export credit company, has signed a MoU with Markel International, a specialist insurer that handles the commercial insurance and reinsurance needs of major businesses, SMEs, professionals and sole traders through its offices across the UK, Europe, Canada, Latin America and Asia Pacific. The partnership will allow ECI, a federal government owned entity, to fulfill its mandate of assisting UAE businesses to drive in more growth and trade activity while also reinforcing its commitment to support the country’s non-oil diversification strategy. Under the MoU, ECI and Markel will mutually cooperate to design and deliver bespoke comprehensive conventional trade credit insurance solutions and services to the UAE businesses, growing the non-oil export trade, said Massimo Falcioni, Chief Executive Officer of ECI, after signing the deal with Ewa Rose, Managing Director - Trade Credit, Political Risk and Surety, Markel International - in the presence of senior officials. "This new alliance is expected to strengthen our continuing efforts in supporting the growth and development of local businesses here in the UAE, especially those in the fields of export, equipping them with the necessary business tools and solutions needed in making them globally competitive," stated Falcioni. "In addition, working closely with Markel International will reinforce our efforts in achieving the goals and objectives of the country's non-oil diversification strategy," he added. Engineer Saed Al Awadi, the chief executive of Dubai Export and Development Corporation, and board member and chairman of the executive committee at ECI, said: "We are building a comprehensive platform of partnerships in order to support UAE businesses." "These collaborations will allow ECI to explore opportunities geared towards understanding the needs of the UAE export community. The strategic association with Markel International will likewise create a strong platform for ECI to boost UAE businesses in line with the UAE Vision 2021 agenda. The agreement reinforces our commitment to service the UAE export community in order to improve their global competitiveness," he added. Markel International Limited is a subsidiary of Markel Corporation, a US-based holding company trading on the New York Stock Exchange. On the tieup, Rose said the UAE was currently the largest market for trade credit insurance in the Mena region. "This has also been the strategic location where a majority of the credit insurers have their base and use it as a hub to support businesses in the region. The UAE offers stable economic and political environment, ease of doing business, relatively healthy regulatory and legal environment and geographical positioning, making it a trading hub for the region with access to quality talent," she stated.